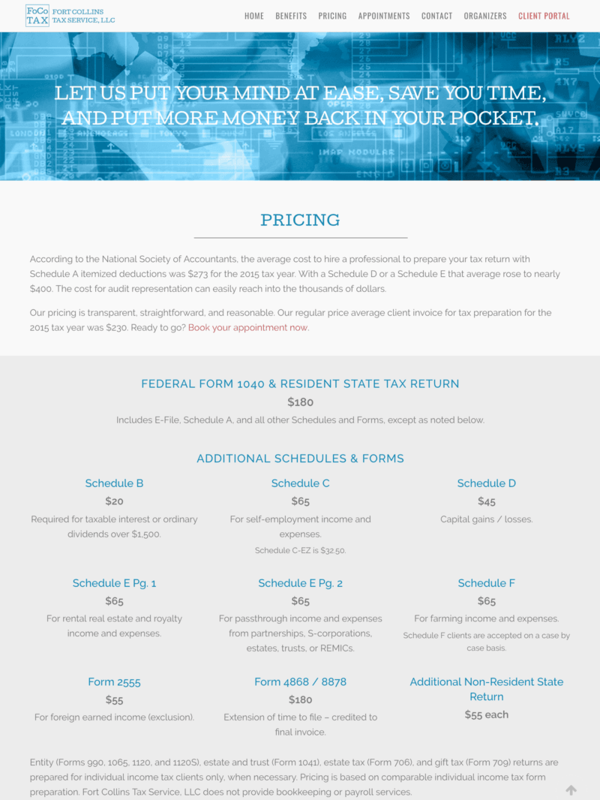 Jason Speciner, our financial planner and tax consultant client, came back to us for another website. This time, one to service his tax servicing business, Fort Collins Tax Service. With the thinking that "less is more," Jason's compact message needed very little room to communicate his unique value proposition and services. Jason's needs were very simple so a minimalistic design approach was considered. Our designer, Ellen Bryant, created a one-page website for Jason that is easy to read and navigate. With a sticky header, users can click-and-scroll to sections of the same page and never lose sight of the menu. Using the same subdued colors and share of white-space as his previous site, we've preserved a warm, modern look-and-feel. A call-to-action banner enticing potential clients to reach out.